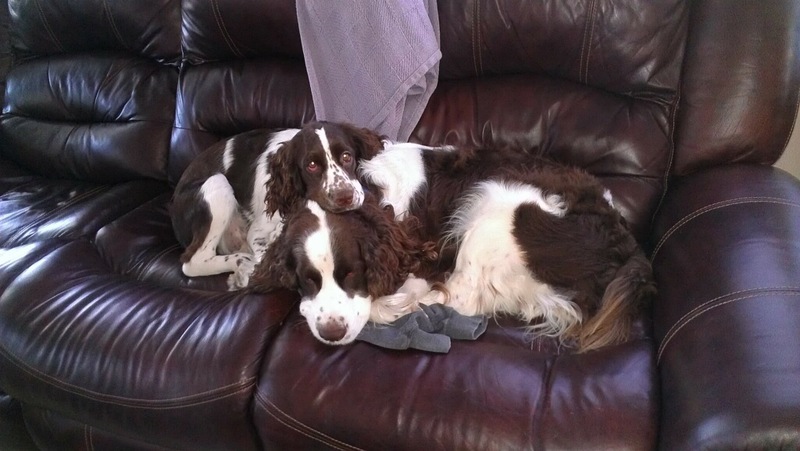 Duke and Maggie, two Springer Spaniels. Over the course of the last 20 years, I have had three gun dogs, Springer Spaniels, trained for Rattlesnake avoidance by three different trainers. My first dog was trained by Patrick Callahan of Game land K is everybody ennels in Norco, California. Callahan did a good job at training my first Springer to avoid rattlesnakes. This dog had a long life and by the time I was ready to train my second Springer Callahan had unfortunately, passed away. I then searched for a second trainer and came across another trainer, who was training in front of the Bass Pro Shop in Rancho Cucamonga, California. This trainer continues to hold training periodically at Bass Pro Shop. I took my second Springer to the other training on a very warm day where temperatures reached into the 90s. The young man completing the training was, in my opinion very showy and appeared impressed with himself and seemingly wanted others to be impressed by him, and did not seem to be very interested in the dog himself. He took no time with the dog and kept calling him a “her.” Although my now four-year-old gun dog went through the training that did include sight, sound, and smell, I was not convinced that the training was adequate and I had always doubted whether or not this dog was trained to the point of staying away from rattlesnakes. My wife purchased a new female gun dog two years later, and when she was one year old, I came across an ad for Web Parton. I reviewed a YouTube video on Mr. Parton and that’s what made me decide to take my one-year-old to him. Mr. Parton was also working his week-long event at Bass Pro Shop in Rancho Cucamonga. I immediately noticed the difference in training between the three trainers. Mr. Parton conducts his training with a small group of dogs so that they can learn from each other. He took time to associate with my dog and the others in a group and explained everything to the owners in detail so they understood all the aspects of the training. Mr. Parton probably spent 20 minutes on my dog alone. He made sure that the dog knew what the smell of the Rattlesnake was, which is their primary way of identifying them, and used different rattlesnakes with different temperaments, so that the dog would see them and then hear the rattle when the snake became agitated. Mr. Parton used a variety of scenarios in order to thoroughly train the dog to avoid the Rattlesnake. He took extra time with my little girl dog because she was smart enough to try and outfox the collar and snake and still try to get up to it. Mr. Parton did not stop training her until he was confident she would avoid rattlesnakes. Mr. Parton instructed me for one scenario to try to walk up on the snake with my dog. During the training, this one-year-old Springer had learned enough to stay away from the Rattlesnake and blocked my path to warn me of the danger. I was fairly confident she would avoid rattlesnakes whenever possible. I decided to have my now six year old Springer retrained by Mr. Parton. The past training had possibly worked in the area of sound with this dog as I noticed Mr. Parton took an enclosed bucket with a Rattlesnake in it from his truck and the snake began to rattle. My six year old Springer heard this and keyed on the bucket. However, this is where his learning had apparently stopped. This dog got very close to the snake, within a couple inches, to see it and smell it. It did not seem that the dog knew that the smell of the rattlesnake was dangerous. Mr. Parton re-trained this dog and at the end of the training, the dog wanted no part of the rattlesnake. I was confident this dog would avoid rattlesnakes in the future because of Mr. Parton’s training. I would encourage anyone with a dog that lives in rattlesnake country to go through Mr. Parton’s Rattlesnake Avoidance Training. It was well worth the time and money.